Ayurvedic philosophy states believes that individuals who are Kapha dominant tend to gain weight easily than the other dosha types. Vata individuals are usually skinny and do not put on weight easily; Pitta types are usually blessed with a proportional body weight. Ayurveda believes that out of the three basic doshas, the Kapha dosha easily accumulates with fat, which further slows down the metabolism of fat, thus leading to obesity. Kapha types need to be more cautious and strict with themselves in maintaining a regular exercise routine and eating a healthy diet. The Ayurvedic philosophy is rooted in the belief that all good health begins with digestion, or the proper metabolism of food. The most important thing we can do for our health is to ensure that we choose our food wisely. Hippocrates famously stated, “Let food be thy medicine, and medicine thy food”. This phrase tells us much about the healing power of food. A shloka (the ancient writing texts of Ayurveda) states that if we consume foods that are suited to our physiology and adhere to a sattvic (full of life force) lifestyle that supports digestion, our bodies will greatly benefit. Leading a sattvic diet will give us more health, happiness and vitality throughout life. One of the main causes of obesity is overeating, and taking meals at irregular times. Be conscious of whether you are actually hungry or eating to deal with stress, boredom or any other negative emotional response (anxiety, anger, sadness, depression, guilt, etc). Eat your meals on time every day and avoid delaying your meals. Eat natural foods that are organic, pesticide-free and free-range as much as possible. Avoiding processed, genetically modified foods (GMOs), foods with artificial preservatives and synthetic chemicals. Consume a wide range and quantity of vegetables and fruits. Not only are they nutritious but they are excellent cleansers for our internal organs. Vegetables need not be consumed as a separate dish, but can easily be added to grains, stuffed in breads, and tossed into soups and stews. Ayurveda recommends foods that are bioavailable, which means it is easier for the body to extract nutrients from such foods. This is done by cooking your vegetables instead of consuming them raw. While it is believed that raw vegetables contain more vitamins and nutrients, they are also harder for our bodies to metabolize. If a vegetable is eaten raw, imagine how long it can take for the digestive enzymes and digestive fire to completely penetrate the core of the vegetable and break it down. For those who enjoy eating salads, consume your raw veggies during lunch time, so as to give your body enough time to digest the food. The sun is the highest in the sky during the afternoon hours, and this is the time that our digestive agni is at its most optimal potency. As the sun sets, so does our digestive agni. Most of us believe that it_Ñés best to eat a heavy breakfast, medium lunch and a small dinner. Because the digestive agni is strongest during the afternoon, lunch should ideally be the largest meal of the day. Eating a lot of raw vegetables or heavy meats which are hard to digest. Having an inherently weak digestion caused by an imbalance or as a result of stress. Eating late in the evening or night when the body needs to rest, and is not ready for the work of heavy digestion. Avoid this by eating a lighter and well-cooked meal a minimum of three hours before going to bed; try to go to bed at 10 p.m. or earlier. Insufficient hydration. Without enough hydration in the body, the body cannot properly remove impurities present in the lymphatic system. The flow and production of blood can be impacted negatively as a result, which can prevent the body_Ñés ability to maintain oxygen and carry nutrients throughout the body. Ayurveda suggests that each meal should contain all six flavors, namely salty, sweet, sour, bitter, pungent and astringent. 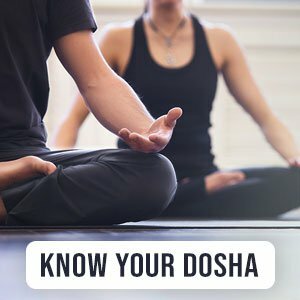 The dominance of the flavors we consume will be based on our dominant dosha constitution. For example, Kapha types may prefer pungent dishes; Vata types might favor heavier meals that have salty or sour flavors; Pitta dominant people generally prefer sweet flavors. Do a detox cleanse with the change of each season to eliminate ama from the body. It is recommended in early spring, during the time that nature begins its annual cycle of regeneration. Avoid fad diets that are usually accompanied with the media hype which advertises new research on certain foods, diets or drinks that are “guaranteed” to work. Besides, it can be a challenge to keep up-to-date on the latest fads that dictate what to eat, when and how.